You can choose to ignore all pause ad improvement tasks that are based on CTR data. Given enough conversion data, Opteo will use CPI (conversions per impression) instead of CTR when it recommends "Pause Ad" tasks. When there are not enough conversions to use CPI, Opteo falls back to CTR. You would just dismiss the task for a while (eg. 7 days or 30 days) to let it accumulate more conversion data and hopefully come back with conclusive CPI data. Select the desired client from your Client List. Open your Client Settings (the gear icon to the top-right of any client page), then scroll down to CPI Override and check the box that says 'Ignore CTR based "Pause-Ad" tasks'. What is CPI and why is it useful? Conversion Per Impression is a metric that shows the ratio between conversions and impressions (CPI = conversions / impressions). It's a way to incorporate both Click-Through Rate AND Conversion Rate. This way, you're truly optimising for the ads that generate the most conversions. 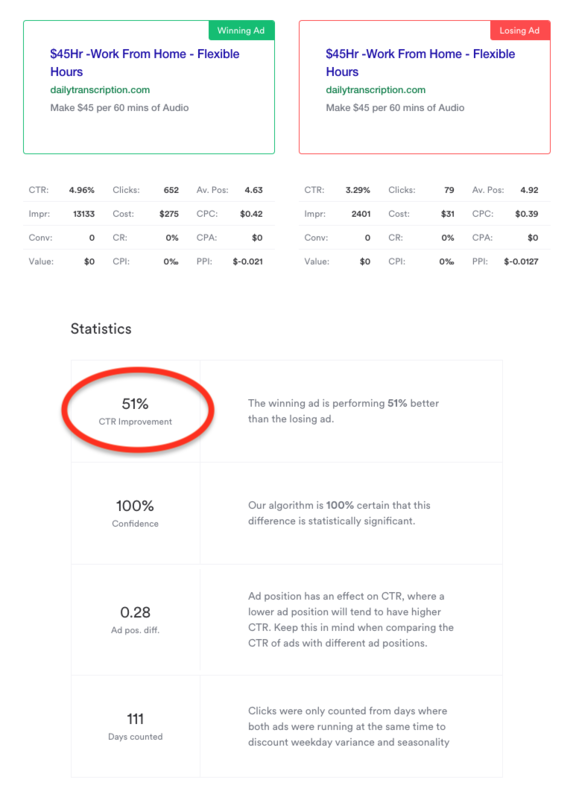 You can see that we would have picked Ad A as the winner if we were looking at CR%, but in fact Ad B is the better ad if you're looking to maximize conversions. If you're looking to learn more about CPI, here's an in depth article about CPI in ad testing.